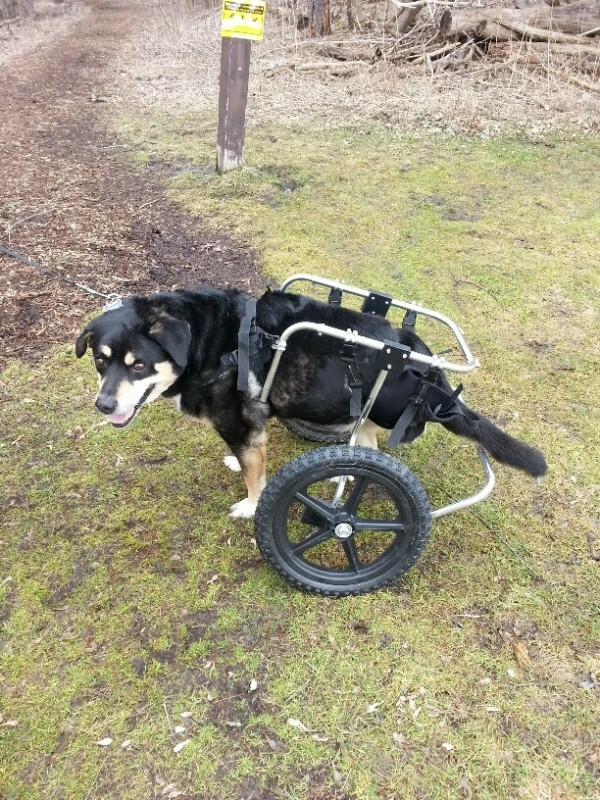 In a very short time frame, Chance began to high step with his hind limbs and started standing for longer periods of time without the support of his cart. By the end of October, he no longer wanted to be in his cart. He could walk and even use stairs on his own. Why did the cart have such a profound effect with Chance’s rehabilitation? Chance became part of the family and re-discovered the world the way a cat should see it. Pets with mobility issues can feel left out and become depressed. 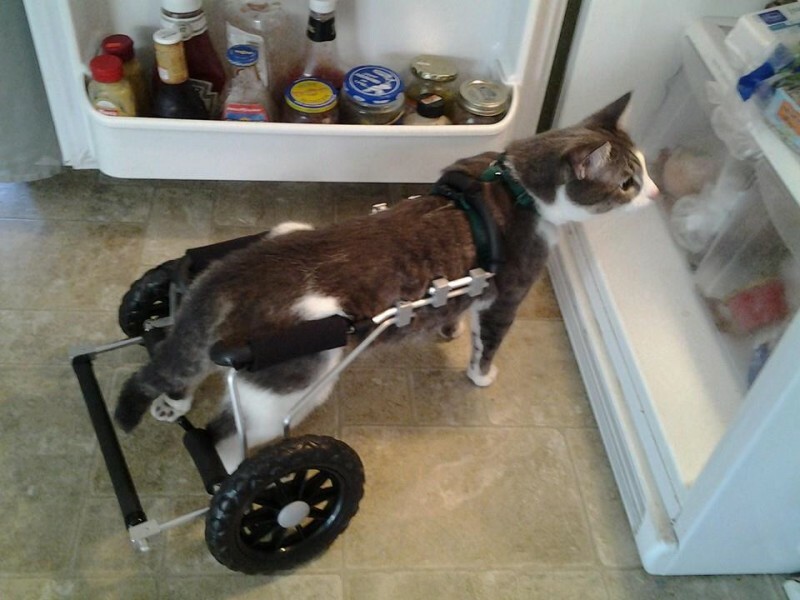 His foster mom was able to do more structured exercises with Chance while using the cart. Having an “extra hand” allowed both hands free to work with a pet. Cody had his left rear limb amputated since he was about 10 months old. The gait adaptations that help a tri-pod pet get around also causes compensation in their remaining limbs and back. To help Cody remain active and prevent compensation, his family ordered a cart for him. However, he didn’t really adjust to it very well and would even occasionally tip over! Cody and his family came to see us to trouble shoot his cart. After a few adjustments and walking exercises with lots of positive reinforcement, he began to really enjoy using it. Cody can now be found cruising around the dog park with his family. He also enjoys long walks in the local trails even in the snow. How did the cart help Cody? It allows tri-pods, like Cody, to stand and walk with a normal posture like a 4-legged pet. The support relieves some of the stress that are placed on remaining legs. If a pet doesn’t acclimate to a cart, it might not be fitting properly. Why Should a Cart Be Used? Carts can be a great tool in rehabilitation therapy. 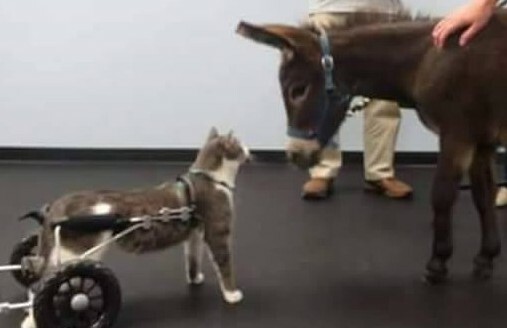 For pets who are not expected to walk again, carts are still not a “last resort.” They can translate into improved quality of life, which is a precious thing! To read more about assistive devices such as carts, follow this link. Read about Chance on our Pet of the Month page here, or check out his Facebook page here.